By selecting meat to your preference and blending your own seasoning, stuffing sausages at home can allow you to customize a blend specific to your taste. You can also avoid concerns about meat “scraps” and other unsavory ingredients that may be found in commercially prepared sausage. 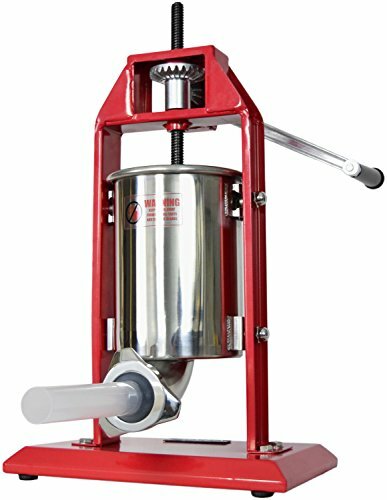 Our top pick is the LEM 5lbs Vertical Sausage Stuffer. Although it’s a more compact model, we love that there’s virtually no waste and it is super easy to use – perfect for making small batches at home. In this guide, we will explore some of the best sausage stuffers through our model comparison and sausage stuffer reviews. Why Buy A Sausage Stuffer? 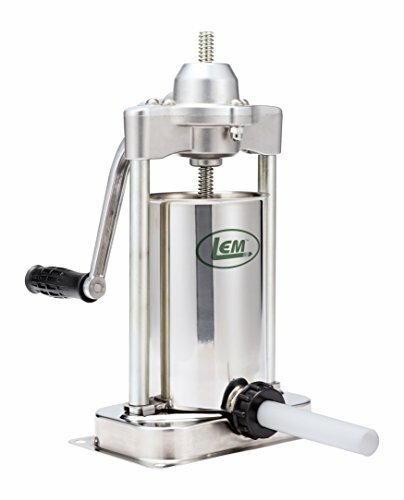 The LEM vertical sausage stuffer is a hand-crank sausage stuffer that comes with three plastic output tubes in 1/2″, 3/4″, and 1″ sizes. It’s made of metal parts, meaning it’s durable and easy to clean. LEM ships two C clamps with each unit to help you hold it down while you work. When this unit is fully clamped down, it’s easy to operate with one hand. There’s an automatic air release valve to make operation extra simple. The cylinder on this unit makes it particularly unique. Most competing models have cylinders that rotate for filling and can be removed as an option. On this unit, the cylinder pops out easily as your default filling option. This means you can set it up farther away from where you store your meat, with a bit less hassle on each refill. There’s a notable lack of waste here. Nearly all of the meat will be pushed out of the machine when the piston finally reaches the bottom. The amount left over is hardly worth commenting on. The LEM Products Sausage Stuffer is smaller than our other picks and the plastic output tube will be a deal breaker for some. Still, it’s easy to operate with one hand and the ease of detaching the cylinder makes filling and cleaning less complicated than with other models. If you don’t process huge batches of meat at a time, this may be an excellent sausage stuffer for your household. VIVO offers a seven-pound, crank-driven vertical sausage stuffer with four plastic output tubes in 0.4″, 0.79″, 1.18″, and 1.57″. All the internals are constructed of metal for durability and ease of cleaning. It’s a bit larger than the LEM Products model and the base is stable enough for one-handed operation without clamps. An automatic air release valve helps keep internal pressure manageable. While this is a fair bit larger than the LEM, it leaves noticeably more food in the bottom of the cylinder when it’s “done.” You have a choice between loading in more meat to keep pushing things through or scraping out the meat and using it for something else. The cylinder on this unit tilts back for filling. You can lift it out completely if you desire, with a minimum of hassle. The entire unit can be disassembled for cleaning after you’re done with each job. The New VIVO sausage stuffer is an attractive size upgrade over the LEM. 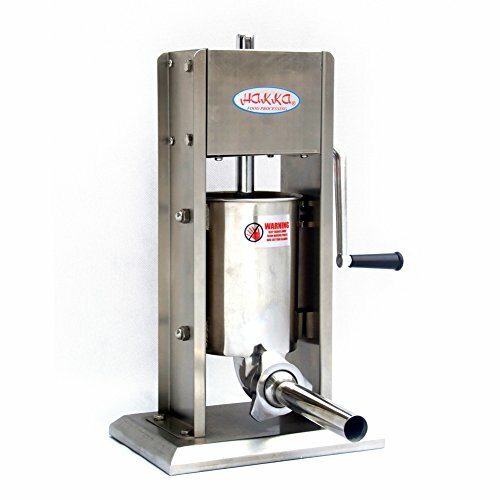 The HAKKA sausage stuffer is a seven-pound, crank-driven vertical sausage stuffer with four stainless output nozzles in 0.62″, 0.86″, 1.25″ and 1.5″. It has two speeds – one of which is primarily used for slow feeding while the other is used to quickly reverse the plunger. Like our other picks, there’s an air release valve built in so you don’t have to worry about pressure build up. The build quality on this machine is excellent. It’s solid, durable and well machined. The whole thing disassembles easily. Like the VIVO, the cylinder tips for feeding and can be removed entirely if you so desire. While the metal nozzle tips are a pretty big plus, there’s no reverse-lock on the crank. As you crank and compress the meat in the machine, pressure will build up. If you take your hand off the crank, it’ll spin backward as the pressure in the chamber pushes the piston back up. It’s pretty easy to operate this machine with one hand while your other hand manages the sausage casing, but you do have to actually keep one hand on the crank the whole time. The amount of meat left in the HAKKA sausage stuffer when the piston is fully compressed is about the same as the VIVO. The Dakotah is a horizontal water-pressure driven sausage stuffer with two plastic output tubes in 3/8″ and 3/4″. To operate it, you attach a hose to the unit and control a valve that modulates the flow of water into the unit to control the pressure on an internal plunger. There’s no cranking required. All you have to do is operate a valve and keep a hold of your sausage casing. Without an internal engine, this machine may be more budget-friendly than mechanized sausage stuffers. It’s a great option if you don’t need to process industrial quantities of meat and want to avoid cranking, which makes it a great option for home use. Operating this machine can be a bit tricky at first, but once you get used to controlling the water pressure with one hand while managing your casing with the other, you’ll be making sausages quite quickly. While the machine boasts a nine-pound capacity, filling it up all the way is a minor pain. You’ll need to really work with your hands to get meat all the way down to the bottom of the cylinder. You also need to work somewhere with a hose to power the unit, which means you’ll probably be stuffing outside or running a hose through your house. Both options are slightly awkward compared to just sticking a crank-driven model on your kitchen counter. If you don’t think you’ll use your sausage stuffer a whole lot but still don’t want to crank your machine, the Dakotah sausage stuffer is an excellent budget option. The Weston Commercial #22 is a vertical meat grinder and sausage stuffer with an electric motor. It comes with three plastic sausage output tubes in 20mm, 30mm, and 40mm. The machine is terrifyingly capable when it comes to both grinding and stuffing. It can output over 700 pounds of sausage per hour, should you have a place to store it. Despite the industrial performance, this machine is still easy to disassemble and clean. You can easily pop off all of the parts that make contact with food and clean them in the sink after each use. Extra-thorough clean up should take less than ten minutes. If you’re content with hot water and soap, you can be far faster than that. Unlike the other sausage stuffers we’ve looked at, this machine will grind meat – bones and all. If you’re processing game or think you want to make your own dog food at home, this is a welcome feature that can save you many trips to the butcher. 100 lbs. of deer meat can be ground in something like six minutes, provided it’s all trimmed and ready to be fed. The grinding mechanism in this machine has no problem handling bones, cartilage, or skin. If you’re ready to take the step up from a crank-driven model, this machine offers a colossal increase in speed. Whether or not it’s worth the price probably depends on how serious you are about sausage and how much mileage you’ll get out of the meat-grinding capabilities. There are plenty of justifications for buying a sausage stuffer. You may have access to bulk meats; for example, if you buy a half a cow or hog at any point in the year instead of purchasing meat at grocery store prices, you may have some cuts of meat that are best ground and spiced or smoked. People with extreme food sensitivities to spices or preservatives might want to make their own sausage to guarantee what they’re eating. Household chefs and fans of blending their own seasoning blends are great candidates for a sausage maker. For those with the skill to hunt and access to wild game meat, sausage-making is an excellent way to use up less than ideal cuts of meat. Grinding the sausage meat may not be possible for every household. If need be, you can get the meat ground at a local butcher, then season and stuff at home. Although most sausage stuffers are pretty straightforward with no extra bells and whistles, it does pay to keep a few key factors in mind when choosing which one is best for you. Quality – No matter where you grind your meat, purchasing a reliable sausage stuffer is critical. You don’t want to be waiting for a part while a batch of seasoned meat spoils because your stuffer broke down. Purchasing a unit that offers a good warranty and easy access to spare parts would be wise. Manual or electric – Manual stuffers offer you more control and will be kinder to your wallet, however electric stuffers can process a lot more meat if you want to make bulk sausages. Cleaning – Consider whether your sausage suffer is easy to disassemble, clean, and put back together. If you don’t have a lot of time or strongly dislike kitchen clean up, this is an important factor. Volume – Are you making a few sausages for the family, or processing a huge number for storage? Sausage stuffer capacities can vary greatly, so check on this before you buy. If you have a KitchenAid stand mixer, you can make your own sausage and stuff it into casings with two simple grinder attachments, the food grinder, and the sausage stuffer. These tools attach to the front of your mixer. Simply feed the meat down the chute and it flows directly into the sausage casing. If you prefer to season the ground meat before stuffing, grind it into a bowl, stir in seasonings, and re-grind into the casing. For small batches, a manual sausage stuffer can be handy. To use, load ground and seasoned meat into the hopper, attach the casing to the tube on the front, and crank. The sausage is pressed out of the hopper by a large plate on the top and forced into the casing through the tube. If you’re going to be stuffing sausage alone, a motorized sausage stuffer is a great option. Part of the challenge of making sausage is handling the casings, which can get slippery and require some monitoring. If you need to be cranking, you can’t be watching the casing. 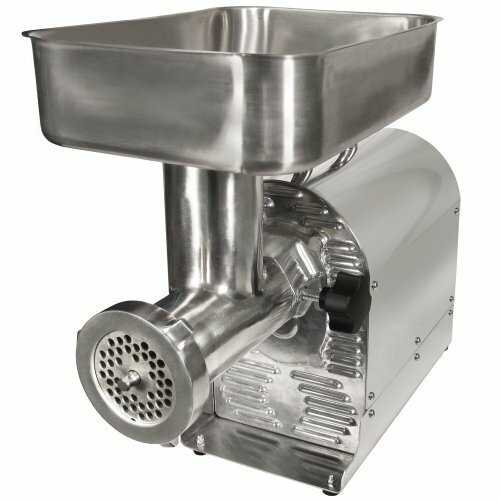 Weston offers a heavy-duty electric sausage stuffer with grinding capabilities for large batches. Depending on your batch size, this machine may be more power than you need. Smaller horsepower machines are also available from this manufacturer, as are manual versions. In a horizontal sausage stuffer, the cylinder that holds the meat is mounted horizontally. The design of these models is such that you will need to hang part of it over the edge of your table or counter in order to operate the crank. This is the most popular model of sausage stuffer. Available in manual or electric, they can usually hold a lot more meat – between five and fifteen pounds – and the cylinder is mounted vertically. These type of sausage stuffers are manual only. They are a good choice for beginners at the art of stuffing, and can only fit a small amount of meat (around three to five pounds). With a sausage stuffer, you can make the freshest, most delicious sausages to suit your exact tastes, as well as getting a bit experimental with different meats and flavors. If you have a bulk load of meat to get through, there are models that can process it through to the casings in record time, but even if you just feel like homemade sausages for the Sunday family grill, there’s the right sausage stuffer out there for your needs. Don’t have a grill? Check out how to make sausages in the oven here. For moderate home use, we love the LEM 5lbs Vertical Sausage Stuffer for its ease of use, compact size, and cleanability. Did you enjoy this guide? Let us know in the comments with your favorite sausage stuffer and sausage-making experiences.